USS George H.W. Bush (CVN-77) is the tenth and final Nimitz-class supercarrier of the United States Navy. She is named for the 41st President of the United States and former Director of Central Intelligence George H. W. Bush, who was a naval aviator during World War II. Bush‘s callsign is Avenger, after the TBM Avenger aircraft flown by then-Lieutenant George Bush in World War II. Construction began in 2003 at the Northrop Grumman Newport News shipyard’s Dry Dock 12, the largest in the western hemisphere. She was completed in 2009 at a cost of $6.2 billion and her home port is Naval Station Norfolk, Virginia. Bush stretches 1,092 feet and displaces over 100,000 tons, making her one of the world’s largest warships (though she is slightly shorter than USS Enterprise). Her top speed exceeds 30 knots; powered with two nuclear reactors, she can operate for more than 20 years without refueling. Several features differentiate CVN-77 from other ships in the Nimitz class. New features include a bulbous bow design that provides more buoyancy to the forward end of the ship and improves hull efficiency, curved flight deck edges to reduce radar signature, a new underwater hull-coating system, deck covering modernized to reduce ship weight by 100 tons, low Solar Absorptive and Anti-Stain Paint, a less cluttered hangar bay, and a new propeller design. Bush is the second carrier to have a modernized island, which includes a new radar tower (enclosed to reduce radar signature), navigation system upgrades, communication systems enhancements, and transparent armor windows. The island is smaller and has been repositioned farther aft to improve flight deck access and reduce signature and electronic self-interference. New air operations design features include an updated aviation-fuel storage and distribution system, semi-automated refueling and servicing with new deck locations to provide faster, more efficient aircraft pit stops, requiring fewer people, modernized aircraft launch and recovery equipment, and redesigned jet blast deflectors. Environmental upgrades have also been designed into the ship, including a vacuum collection/marine sanitation device (VC/MSD), a new marine sewage system that uses fresh water in lieu of sea water for lower maintenance costs. Many older ships in the U.S. Navy utilize a gravity-driven collection holding and transfer (CHT) system to handle sewage waste. Newer U.S. Navy ships, including now CVN-77, collect sewage waste by vacuum, allowing for greater flexibility in piping installation, smaller pipe sizes overall and reducing water consumption. The collection tanks of Bush were modified to accommodate both the VCHT (Vacuum CHT) equipment and the elements of a marine sanitization device to treat the waste prior to discharge. Bush is the first and only aircraft carrier in the U.S. Navy to combine the two technologies. This new VC/MSD driven waste management system has, however, not been without problems. Reports began surfacing immediately after delivery in May 2009 of issues with the ship’s toilet system. As of November, 2011, the entire system has gone down at least twice, rendering all 423 commodes in the ship’s 130 heads inoperable, with many more incidents that have rendered either half of the ship, or sections of the ship, without operating sanitary facilities. In one ship-wide incident, a repair crew spent 35 non-stop hours attempting to return the system to working order. The system is said to suffer breakdowns when inappropriate materials such as feminine hygiene products are flushed down the toilets. During a four-month maintenance period in dock in 2012, anti-clog measures were installed in the ship’s toilet disposal systems. New electronics and communications technology, space rearrangement, operational procedure changes, advanced sensor technologies and maintenance systems have been incorporated to reduce manning costs. A new zonal electrical distribution system will keep problems from affecting other parts of the ship. Automated material movement devices, semi-autonomous, gravity compensated weapons handling devices, damage control automation systems and components have also been installed. Medical and dental equipment have been upgraded, integrated display screens in Damage Control Central have been modernized to improve data integration and display, and equipment in general shops has been modernized to improve productivity. The contract to build CVN-77 was awarded to Northrop Grumman Shipbuilding Newport News on 26 January 2001. 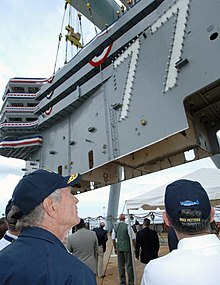 A naming ceremony was held on 9 December 2002 at Northrop Grumman Newport News, with Former President George H.W. Bush attending. Secretary of the Navy Gordon R. England, presided at the ceremony. The keel laying ceremony was held on 6 September 2003, with Former President George H. W. Bush serving as the keynote speaker. Former First Lady Barbara Bush also attended with their daughter, Dorothy Bush Koch, the ship’s sponsor. The former President authenticated the keel by chalking his initials onto a metal plate. His initials were then welded onto the plate, which was permanently affixed to the ship. The ship was modularly constructed, where large sections are assembled and then lifted into place using a large crane. Major milestones in the construction include the bow placement in March 2005, followed by the island placement on 8 July 2006. The 700-ton island was lifted onto the flight deck in a ceremony called “stepping the mast,” which dates from antiquity and consists of placing coins or other items of significance under the step or bottom of a ship’s mast during construction. Since at least the construction of USS Constitution in the 1790s, this tradition has been passed on as a symbol of good luck for U.S. Navy ships. George H. W. Bush participated in the event, placing his naval aviator wings underneath the island during the ceremony. George H.W. Bush was christened on 7 October 2006. Former President George H. W. Bush attended the ceremony and became the first president in history to participate in the christening of his namesake ship. President George W. Bush also attended and honored his father during the ceremony as a special guest speaker. Other officials participating in the ceremony included Secretary of Defense Donald Rumsfeld, Secretary of the Navy Donald Winter; Virginia Senators John Warner and George Allen, Virginia Gov. Tim Kaine, and Chief of Naval Operations Admiral Michael Mullen. Other construction milestones included catapult system testing on the ship’s flight deck on 25 January 2008. Former President George H. W. Bush signaled the launch of two “dead loads” off the deck of the carrier. Dead loads are large, wheeled, steel vessels weighing up to 80,000 pounds, simulating the weight of actual aircraft. On 11 August 2008, the Pre-Commissioning Unit (PCU) crew moved aboard the ship, the first meals were served in the galley, the U.S. flag was raised on the fantail for the first time, and the first watches were set. Bush left Northrop Grumman Ship Building for the first time on 23 December 2008, proceeding a few miles down river to Norfolk Naval Station. USS George H.W. Bush was commissioned 10 January 2009 at Norfolk Naval Station prior to her official delivery to the Navy. 15,000 people were in attendance including veterans of the USS San Jacinto, the ship George Bush served on during World War II. President George W. Bush delivered the principal address, George H.W. Bush set the first watch, and ship’s sponsor Dorothy “Doro” Bush Koch gave the order to “man our ship and bring her to life!” A GM-built Grumman TBM Avenger like the one then-Lieutenant junior grade George Bush flew in World War II performed a fly-over. Northrop Grumman Corporation Builder’s sea trials were completed on 16 February 2009, providing an opportunity to test systems, components and compartments at sea for the first time. The trials included high-speed runs and a demonstration of the carrier’s other capabilities. Following builder’s trials, the ship underwent acceptance trials on 10 April 2009, conducted by representatives of the U.S. Navy Board of Inspection and Survey, to test and evaluate the ship’s systems and performance. Bush was officially delivered to the Navy on 11 May 2009. The first fixed-wing flights were conducted on 19 May 2009 when F/A-18 Super Hornets from Air Test and Evaluation Squadron at Naval Air Station Patuxent River, Maryland began flight deck certification, which tests a carrier’s ability to conduct air operations. On 26 May 2009, Former President George H.W. Bush and his daughter, Dorothy Bush Koch, flew aboard the carrier to observe flight operations during the ship’s underway period in the Atlantic Ocean. USS George H.W. Bush successfully completed her first flight deck certification on that day. Bush returned to Northrop Grumman Newport News shipyard on 18 June 2009 for post-delivery maintenance work, also known as the ship’s post shakedown availability (PSA). A PSA is a typical availability in the early life of a carrier that allows the Navy and builder to resolve any items that came up during trials and delivery and make any last-minute changes and upgrades. Work includes the installation of a Rigid Hull Inflatable Boat (RHIB) handling system and a new fresh water purification system. Other changes include compartment reconfigurations, combat system and radar equipment upgrades, and minor repairs. The work was scheduled to last through early 2010. The ship was assigned to Carrier Strike Group Two for her first deployment. Under the command of Rear Admiral Nora Tyson, George H.W. Bush, Carrier Air Wing Eight and the four ships of her group departed on her first deployment on 15 May 2011. They sailed across the Atlantic to Britain to participate in Exercise Saxon Warrior, held in the Western Approaches and culminating in a so-called ‘Thursday War‘. She then moved towards Portsmouth, England on 27 May, anchoring adjacent to Stokes Bay through 31 May, because she was too large to enter the harbor, and the naval base did not have sufficient nuclear berths for the carrier to moor alongside. The carrier arrived at Naples, Italy on 10 June 2011. The carrier returned to Norfolk on 10 December 2011, following a seven-month deployment supporting operations with the U.S. Navy’s 5th and 6th fleets. George H.W. Bush undertakes carrier qualifications in the Atlantic in May 2013; an F/A-18F Super Hornet is on the catapult; another F/A-18F and an X-47B are parked forward of the island superstructure; two more F/A-18Fs and four C-2 Greyhounds are parked aft. On 25 July 2012, George H.W. Bush began its four-month overhaul at Norfolk Naval Shipyard at Portsmouth, Virginia, included scheduled short-term technical upgrades. On 1 December 2012, George H.W. Bush completed its PIA maintenance cycle and began sea trials on 3 December 2012. After completing sea trials on 4 December 2012, the carrier started its training and qualification cycle in preparation for the group’s 2013 deployment. During a two-week underway period beginning 14 January 2013, George H.W. Bush tested the MV-22 tilt-rotor aircraft from squadron VMX-22 as a potential carrier on-board delivery aircraft as well as operating mine-sweeping MH-53E helicopters from squadron HM-14. During another underway period, George H.W. Bush conducted at-sea tests for X-47B unmanned drone in the Atlantic Ocean, including the first time that an unmanned drone has been catapulted off an aircraft carrier on the morning of 14 May 2013 (pictured). On 17 May 2013, another first was achieved when the X-47B performed touch-and-go landings and take-offs on the flight deck of Bush while underway in the Atlantic Ocean. Also during this two-week underway period, the aircraft carrier tested a new torpedo self-defense system, as well as completed more than 115 launches and landings in assessing a new precision landing system, before returning to Norfolk on 24 May 2013. Bush transits the Straits of Gibraltar in February 2014. In late February 2014, George H.W. Bush transited the Strait of Gibraltar on the way to a scheduled port stop in Piraeus, Greece, for a scheduled port visit. On 5 March 2014, George H.W. Bush arrived in southern Turkey, which is under 500 miles away from Crimea, amid developing tensions over Ukraine with Russia. On 9 March 2014, the carrier entered port in Antalya, in southern Turkey. Some news sources had speculated that the ship’s stay in the Mediterranean Sea would be extended as a result of the 2014 Crimean crisis, but this proved to not be the case with Carrier Strike Group 2 proceeding through the Suez Canal. Carl Vinson (foreground) relieves Bush as the 5th Fleet on station carrier in October 2014. The carrier was transiting the Suez Canal on 18 March 2014. On 23 March 2014, USS Harry S. Truman (CVN-75) officially turned over the watch to George H.W. Bush in the U.S. 5th Fleet area of responsibility conducting maritime security operations and supporting theater security cooperation efforts. On 14 June 2014, George H.W. Bush was ordered to the Persian Gulf to protect US interests in Iraq in light of the Islamic State takeover of several major cities in that country. On 8 August 2014, two F/A-18F Super Hornets launched from the ship and conducted an airstrike on Islamic State artillery shelling the Kurdish city of Erbil. The mission was launched in accordance with President Obama’s announcement on the evening of 7 August that the US would begin airstrikes to protect US personnel and the Yazidis in the region from ISIS attacks. On 23 September 2014 F/A-18 Hornets and Super Hornets from Carrier Air Wing Eight launched from George H.W. Bush in the Persian Gulf to strike at specific targets in Syria such as command-and-control centers, training camps and weapons depots. On 15 November 2014, George H. W. Bush returned to her homeport in Norfolk, Virginia after a nine-month deployment. ^ Jump up to:a b c d e “Future USS George H.W. Bush to Transit”. Naval Sea Systems Command Public Affairs. 18 December 2008. Archived from the original on 25 December 2012. Retrieved 22 December 2008. ^ Jump up to:a b c “Aircraft Carrier Named the USS George H.W. Bush Commissioned”. Fox News. 10 January 2009. Archived from the original on 25 December 2012. Retrieved 2 June 2009. Jump up^ Polmar, Norman (2004). The Naval Institute guide to the ships and aircraft of the U.S. fleet. Naval Institute Press. p. 112. ISBN 978-1-59114-685-8. Jump up^ “USS George HW Bush Project”. USS George HW Bush (CVN 77) Aircraft Carrier, United States of America. Net Resources International/SPG Media LTD. Archived from the original on 25 December 2012. Retrieved 25 December 2012. Jump up^ Fontenoy, Paul E. (2006). Aircraft carriers: an illustrated history of their impact. ABC-CLIO Ltd. p. 349. ISBN 978-1-85109-573-5. ^ Jump up to:a b c d Peña, Fabio. “USS GEORGE H.W. BUSH (CVN-77)”. NavSource Naval History. NavSource Online: Aircraft Carrier Photo Archive. Retrieved 25 December 2012. Jump up^ “USS George HW Bush Project (Construction Photos)”. USS George HW Bush (CVN 77) Aircraft Carrier, United States of America. Net Resources International/SPG Media LTD. Archivedfrom the original on 25 December 2012. Retrieved 25 December 2012. ^ Jump up to:a b “The Ship’s Seal”. USS George H. W. Bush (CVN77). United States Navy. Archived from the original on 25 December 2012. Retrieved 25 December 2012. Jump up^ Pike, John. “CVN-77 – George H.W. Bush”. Global Security. Retrieved 31 October 2011. Jump up^ “Design Enhancements”. Retrieved 3 July 2009. Jump up^ “Northrop Grumman Delivers Final Nimitz-Class Aircraft Carrier to the U.S. Navy”. Globe Newswire. 11 May 2009. Retrieved 31 October 2011. Jump up^ “Carrier Bush suffers widespread toilet outages – Navy News | News from Afghanistan & Iraq”. Navy Times. Retrieved 3 March 2012. Jump up^ “Carrier’s Namesake Tests Catapult”. News.navy.mil. 25 January 2008. Retrieved 31 October 2011. Jump up^ Bailey, Nathan A. (13 August 2008). “PCU Bush Celebrates In-Service Day, Moves Aboard”. News.navy.mil. Retrieved 31 October 2011. Jump up^ Jones, Matthew (10 January 2009). “Carrier awaits a call to come to life in ceremony today”. The Virginian Pilot. Landmark Communications. Retrieved 10 January 2009. Jump up^ “Northrop Grumman Completes Builder’s Sea Trials for USS George H. W. Bush (CVN 77)”. Globe Newswire. 16 February 2009. Retrieved 31 October 2011. Jump up^ “Navy’s Newest Carrier Successfully Completes Acceptance Sea Trials”. United States Navy. 9 April 2009. Retrieved 13 April 2009. Jump up^ “Navy Takes Delivery of Aircraft Carrier George H.W. Bush”. Navy.mil. 11 May 2009. Retrieved 31 October 2011. Jump up^ “Navy’s Newest Aircraft Carrier Lands First Aircraft”. Navy.mil. 19 May 2009. Retrieved 31 October 2011. Jump up^ “USS George H.W. Bush CVN 77”. Uscarriers.net. Retrieved 31 October 2011. Jump up^ “Bush Certified for Flight Ops”. News.navy.mil. 29 May 2009. Retrieved 31 October 2011. Jump up^ “Northrop Grumman Awarded PSA Contract for USS George H. W. Bush”. Globe Newswire. 18 June 2009. Retrieved 31 October 2011. ^ Jump up to:a b  Archived 26 June 2012 at the Wayback Machine. Jump up^ McMichael, William H., “Carrier Bush set for first overseas deployment“, Military Times, 10 May 2011. Jump up^ Ziezulewicz, Geoff, “Navy’s newest carrier reaches Naples during first deployment“, Stars and Stripes, 11 June 2011. Jump up^ “George H.W. Bush Carrier Strike Group Returns from Deployment”. NNS111210-06. USS George H.W. Bush (CVN-77) Public Affairs. 10 December 2011. Retrieved 2011-12-13. Jump up^ Mass Communication Specialist 3rd Class Samantha Thorpe, USN (26 July 2012). “CVN 77 Begins Planned Incremental Availability”. NNS120726-09. USS George H.W. Bush Public Affairs. Retrieved 2012-08-01. and Mass Communication Specialist 3rd Class Samantha Thorpe, USN (24 August 2012). 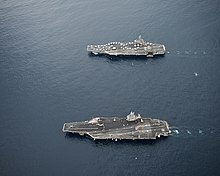 “CVN 77 Starts Planned Incremental Availability”. NNS120824-02. USS George H.W. Bush Public Affairs. Retrieved 2012-10-01. Jump up^ Mass Communication Specialist Margaret Keith, USN (3 December 2012). “CVN 77 Departs Shipyard On Time”. NNS121203-03. USS George H.W. Bush Public Affairs. Retrieved 2012-12-05. and Mass Communication Specialist 3rd Class Samantha Thorpe, USN (3 December 2012). “CVN 77 Back To Sea For Trials”. NNS120726-09. USS George H.W. Bush Public Affairs. Retrieved 2012-12-05. ^ Jump up to:a b “USS George H.W. Bush CVN-77″. 2012-2013 History. USCarrier.net. 18 January 2013. Retrieved 2013-01-18. Jump up^ Mass Communication Specialist 3rd Class Brandon Vinson, USN (17 May 2013). “X-47B Accomplishes First Ever Carrier Touch and Go aboard CVN 77”. NNS130517-15. USS George H.W. Bush (CVN 77) Public Affairs. Retrieved 2013-05-17. The Navy’s X-47B Unmanned Combat Air System Demonstrator (UCAS-D) has begun touch and go landing operations aboard the aircraft carrier USS George H.W. Bush (CVN 77) May 17. Jump up^ Mass Communication Specialist 3rd Class Derrik Noack, USN (24 May 2013). “USS George H.W. Bush Completes Historic Underway”. NNS130524-11. USS George H.W. Bush (CVN 77) Public Affairs. Retrieved 2013-05-29. Jump up^ Mass Communication Specialist 3rd Class Brandon Vinson (10 July 2013). “X-47B Makes First Arrested Landing at Sea”. NNS130710-06. USS George H.W. Bush Public Affairs. Retrieved 2013-07-10. Jump up^ “Glitch forces Navy drone to abort carrier landing”. The Virginian-Pilot. 12 July 2012. Retrieved 12 July 2013. Jump up^ “Navy: Glitch in X-47B Test Only Proves Unmanned Aircraft’s Reliability”. National Defense. 11 July 2013. Jump up^ Christopher P. Cavas (16 July 2013). “X-47B Fails Fourth Landing Attempt”. Navy Times. Gannett Company. Retrieved 16 July 2013. The aircraft developed technical issues while in flight from Naval Air Station Patuxent River, Md., to the ship and officials decided to abort the attempt before the X-47B reached the vicinity of the carrier, steaming off the U.S. east coast. Jump up^ “USS George H.W. Bush arrives in Greece”. Navy Times. Gannett Company. 4 March 2014. Retrieved 6 March 2013. Jump up^ Jeffrey Madlangbayan (9 Mar 2014). “USS George H.W. Bush Arrives in Turkey”. United States Navy. Retrieved 13 Mar 2014. Jump up^ “USS George H.W Bush departs to Mediterranean”. www.stripes.com. Retrieved 10 August 2014. Jump up^ “U.S Engages in Air-Strikes”. news.yahoo.com. Robert Burns. Retrieved 10 August 2014. Jump up^  US, Arab allies launch first wave of strikes in Syria. Retrieved on 23 September 2014. Dyer, Geoff (2014). Another Great Day at Sea: Life aboard the USS George H.W. Bush. New York: Pantheon Books. ISBN 9780307911582.